Since the 1980s, the so-called excimer laser, a “cold” laser, has been used to improve visual acuity. 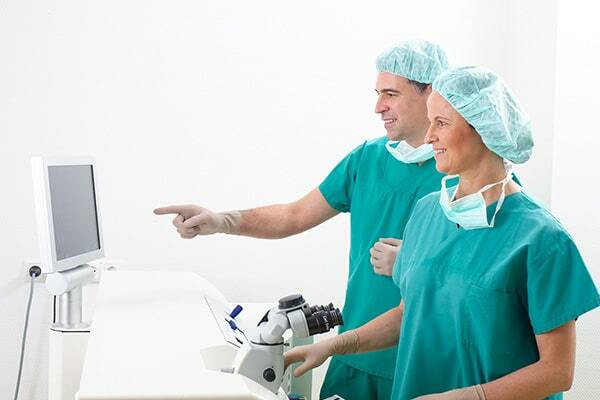 The laser enables us to precisely remove minuscule parts of tissue. It changes the corneal refraction and permanently corrects defective vision. 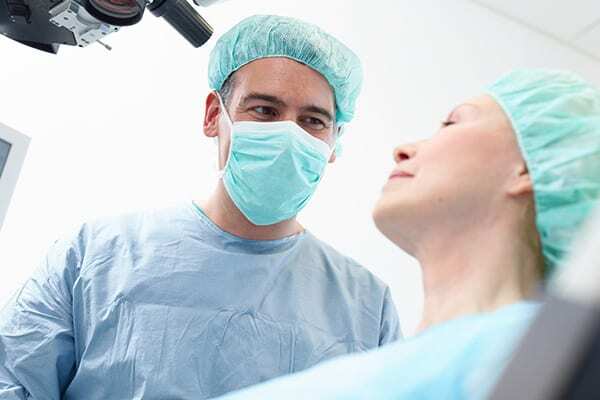 There are different methods of laser surgery: LASIK (Laser-Assisted in situ Keratomileusis), PRK (photorefractive keratectomy) and LASEK (Laser Epithelial Keratomileusis). They differ in different indications and how they are performed. LASIK is the most common laser surgery to correct defective vision. When is laser eye surgery (LASIK) indicated? How is laser eye surgery (LASIK) carried out? During LASIK, a laser works 0.1mm (0.004 in.) under the corneal surface. To get there, a small flap incision is made and opened like a door. The excimer laser works though this opening and removes the exact amount of corneal tissue necessary to improve the individual visual acuity. Whether a patient suffers from nearsightedness, farsightedness or astigmatism, the corneal remodeling varies. The flap incision is closed after the remodeling. Since it fits naturally, it works like a natural band aid. After laser eye surgery (LASIK), you will receive local infusions for 1 week. You are not able to work for 2 days and to perform sports activities for 2 weeks, swimming included. During vitreous humor surgery, also called pars plana vitrectomy, the vitreous humor is removed and replaced by a clear fluid, specific gases or liquid silicone. At the same time, we can treat/remove unhealthy blood vessels. When is vitreous humor surgery (vitrectomy) indicated? How is vitreous humor surgery (vitrectomy) carried out? Vitrectomy normally requires full anesthesia but can also be performed using local anesthetics. 70% of operated patients experience an improved visual acuity. The rate of success in attaching the retina amounts 85%. Miniscule incisions (so-called 23-gauge vitrectomy) make it possible to insert the surgical instruments into the eye of the patient. This procedure is also called keyhole surgery. The vitreous humor is removed carefully. Subject to the disorder/disease, epiretinal membranes (“macular puckers”) or hemorrhages can be removed, and the retina can be reattached. Liquids, gases and drugs can be administered into the eye. Gas serves to secure the correct placement of the retina, which is particularly importent in case of retinal holes, retinal detachment and macular holes. In rare cases, it is necessary to fill the eye with liquid silicone. It can also be required to perform laser eye surgery. After surgery, local infusion therapy is necessary for 3-4 weeks. Depending on the kind of surgery, you should not engage in any sports activities, swimming or flying for 3 weeks. The eyes need about 4 weeks to recover. Relaxation and recuperation is crucial after a vitrectomy. The eye is protected by a bandage, which can be removed the day after surgery. It can be necessary to adhere to a certain posture of the body or head, which will be shown and explained by our team. Take care of yourself and take your time to recuperate! Pay attention to the necessary posture of the body or head. It is essential not to rub or put any pressure on your eyes within the first 2 weeks after vitreous humor surgery. Only gently touching your eye is permitted in case of itching or increased flood of tears because the wound is very sensitive. In case of the intravitreal administration of drugs, medication is directly injected into the vitreous humor. This makes it possible that it only affects the eye and has no side effects on other organs. VEGF means vascular endothelial growth factor and is a natural growth factor of our body that, e.g., stimulates the so-called angiogenesis, the formation of new blood vessels from existing blood vessels. In patients suffering, e.g., from a wet age-related macular degeneration, this growth factor is overactive, causing an abnormal growth of blood vessels in and under the retina. These vessels are permeable, allowing blood and liquids to pass through into the retina, accumulating at the point of sharpest vision. VEGF inhibitors stop this uncontrolled growth of blood vessels. When is intravitreal administration of drugs indicated? How is intravitreal administration of drugs carried out? The intravitreal administration of drugs is subject to rigorous hygienic regulations, which is why it is performed in an operating room. The pupil is dilated by eye drops. The eye and surrounding skin is cleaned. A specific cloth protects the face from germs. The eye is anesthetized by eye drops. A fine eyelid speculum holds the eye open during the treatment. VEGF inhibitors are injected into the eye with a needle through the sclera, which may lead to a minor sensation of pressure. The ocular fundus as well as intraocular pressure are examined after the injection in order to inspect the result and to detect unexpected potential complications at an early stage. An accompanying person can take the patient home as short time after the intravitreal administration of drugs. Because medication is injected directly into the eye during the intravitreal administration of drugs, it is effective within the eye and has no side effects on other organs. The intravitreal administration of drugs is a long-term therapy. The whole eye can neither be cured nor treated by a single administration. Furthermore, the effect of the VEGF inhibitors is not permanent but decreases over time, worsening the condition of the eye if not applied anymore. Due to this fact, it is inevitable to carry on the intravitreal administration of drugs according to an individual treatment plan in order to improve the acuity of vision. Chances of success highly depend on the underlying disorder/disease. You are not able to work or engage in sports activities for one day after the intravitreal administration of drugs.